How do you look at food? Is it a bag of potato chips you munch absently as you watch late-night TV? Or a fast food breakfast on the way to work? Does food fuel and nourish your body or does it just fill your gut when you’re hungry? If you’ve never given a thought to how your diet impacts every aspect of your life, you need to see the eye-opening film, “Forks over Knives”. Even if you feel like you’re in perfect health, silent, killer diseases can be lurking just beneath the surface. High blood pressure, high cholesterol, heart disease, and diabetes all start out silently, creeping up on you until the problem is bad enough to cause troubling symptoms. As the symptoms present themselves, you’ll see your doctor, get a diagnosis and be placed on a series of medications you’ll be dependent on for the rest of your life. Medications that can cause serious unwanted side effects that might make you feel worse than you did when you went to the doctor in the first place. You may be wondering what grocery stores have to do with disease. A lot. “Forks over Knives” explains the disturbing connection between the advent of grocery stores and fast food restaurants in the 1950s and the sudden rise in chronic disease. Does the United States have a healthcare system or a sickcare system? Here’s a sobering statistic: Heart bypass surgery costs a staggering $100,000 per operation and there is an estimated 50 billion dollars in annual revenue from this single operation alone! Here’s another one: Nearly 50% of the United States population is dependent on at least one medically prescribed drug. Why, instead of drugs and surgery, are doctors not concerned with getting to the root cause of disease as a method of cure? Even though President Richard Nixon declared a “War on Cancer” in 1971, cancer rates continue to skyrocket. Women in Kenya rarely get breast cancer; men in the Philippines hardly ever get prostate cancer. Why is this? What are these populations doing differently to save them from these horrible diseases? The answer will really surprise you. “Forks and Knives” notes that cardiovascular disease plummeted rapidly inNorwaydue to the fact its citizens were forced to eat a plant-based diet during the war. As soon as the war was over, meat and dairy was re-introduced and health problems skyrocketed once again. Coincidence? You decide. What about processed food such as soda, candy, and snack cakes containing high fructose corn syrup? Could they be the cause for the obesity and diabetes epidemic in the United States today? “Forks over Knives” pulls back the curtain on this controversial sweetener and explains exactly what HFCS does to your body and brain that makes you crave it so much! Once you understand the way the process of processed food works, you’ll finally understand how to get off the diet rollercoaster and keep the weight off for good! You may think erectile dysfunction is nothing more than an embarrassing sexual problem but it’s actually your body’s early warning sign of this deadly disease! “Fork over Knives” explains why dietary changes, not Viagra, can heal erectile dysfunction and help you live a longer, healthier life. The Western Diet not only affects your physical and mental health, it also greatly increases your carbon footprint. Though you may see cows out grazing when you drive past local farms, these are only the heifers, cows who have not yet had their first calf. “Forks over Knives” explains what happens after the cow gets pregnant and it might be enough to put you off your dinner. “Forks over Knives” thoroughly explains, with patient examples what the whole-food, plant-based diet is and how it has been clinically proven to cure high blood pressure, diabetes, and even cancer without medical drugs or surgery. If you think this is too good to be true, seeing is believing. If you’ve never read a food label in your life, you’re not alone. Food labels are designed to catch your eye with bright colors and attractive pictures. If you see the words “low fat” or “natural” on a food product, it’s healthy to eat, right? Not necessarily. No matter what a product says on the front, back or sides, “Forks over Knives” explains the dangers ingredients hidden in these supposedly healthy products and what you should be eating instead. “Forks over Knives” also explains the role of the USDA and the education system and its affect on the products you and your children eat. In this film, you’ll learn more about Big Agriculture and the government contracts you may never have heard of. Still, you don’t have to be a conspiracy theorist to watch “Forks over Knives”. Unlike many fanatical natural health films that try to tell you everyone is out to get you and nothing is safe to eat, “Forks over Knives” offers a practical, down-to-earth explanation of the plant-based diet without making you feel like a conspiracy theory is being shoved down your throat. However, once you start to understand how corporations influence the development of food guidelines, some of those conspiracy theorists you used to think were crazy before might start making a bit of sense. “Forks over Knives” is unlike other natural health videos you’ve watched. It follows the course of three regular, everyday Americans just like you who are just trying to find a natural alternative to drug and surgery dependency. 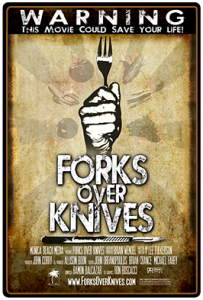 When you watch “Forks over Knifes” you’ll finally understand how to eat to live, instead of living to eat. Think a friend could benefit from this vital health information? Share it on your favorite social bookmarking site!